ethiopian injera in eugene: can. you. dig. it. I’ve said it before and I’ll say it again: Ethiopia boasts one of my favorite cuisines in the world. A big plate of lentils, spicy beef stew, and greens, all scooped by slightly soured, spongy pieces of injera flatbread…heaven. Eugene has no Ethiopian restaurant, and neither do many cities in which we’ve lived, so I’ve tried to make my own. The stews aren’t too hard, once you have the ingredients. If it all seems too much, visiting a Portland Ethiopian restaurant might be the ticket. I’m particularly eager to try top-rated Bete-Lukas Ethiopian Restaurant, and not just because the kind owner, Peter, commented on my recipe for Ethiopian bruschetta the other day! :) But a quick visit to the Bay Area or an online shopping jaunt at Brundo Market for some Ethiopian berebere and shiro powders can take you the distance. I’ve struggled for years with making injera, failing miserably. Some (my husband) might even say spectacularly. I was beginning to suspect that teff flour just wouldn’t ferment in Eugene, with its very unlike Ethiopian weather conditions and radically different airborne flora. Retrogrouch called my results “poop pancakes” and even refused to enter the kitchen when I made them. 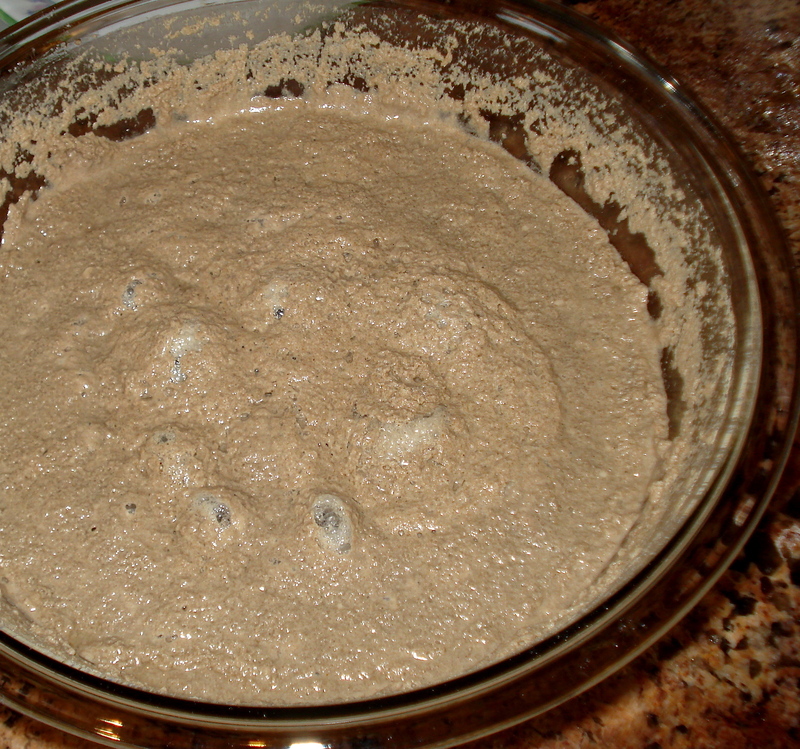 I tried adding beer, yogurt, yeast, soda water, fermenting more, fermenting less…it was ugly. I had to save my marriage, so I put my injera-making dreams aside. Now, several years later, and craving Ethiopian food in this Ethiopian food desert, I’m thankful to have two new injera recipes to try. There is a recipe in one of my favorite cookbooks, Wild Fermentation by Sandor Katz. Another appears in this post. It is from Ceri, a local cook who was kind enough earlier this winter to send me method and pictures, making what seems at first like a complicated procedure look simple. We’ve worked together to write up a recipe that we think everyone will be able to follow. I haven’t been able to test either Katz’s or Ceri’s recipes, so I’d especially love to hear your experiences if you them it a whirl! What excites me most about Ceri’s recipe is that she’s a local cook, and therefore I know that it is possible to ferment injera batter in Eugene. Secondly, she uses 100% teff flour, so the recipe will achieve that delicious, uniquely sour taste only teff can provide. Many Ethiopian restaurants only use wheat flour, or a combination of wheat and teff. Using only teff creates a recipe good for those of us who want to cut down or eliminate gluten from our diets. So, without further ado, please join me in a warm welcome to Ceri! (applause) All the great, instructive images in this post are hers, and I’m so thankful she provided them so we can all learn from her successes and mistakes. Please give her a shout out in the comments to acknowledge her hard work. I was 3 months pregnant, so nauseated that I was eating cold scrambled eggs and rice cakes when I developed an unquenchable craving for injera. I know, not at all a usual craving for a Southern California transplant to Oregon. But there I was, too sick to cook or drive up to Portland, craving injera. While I couldn’t cook, I looked for an authentic injera recipe on the internet. After much trial and error, a large dose of stubbornness, and some luck, I came up with the following method. We ate a lot of injera and Ethiopian food while I was pregnant and injera was my baby’s first solid food after rice cereal. 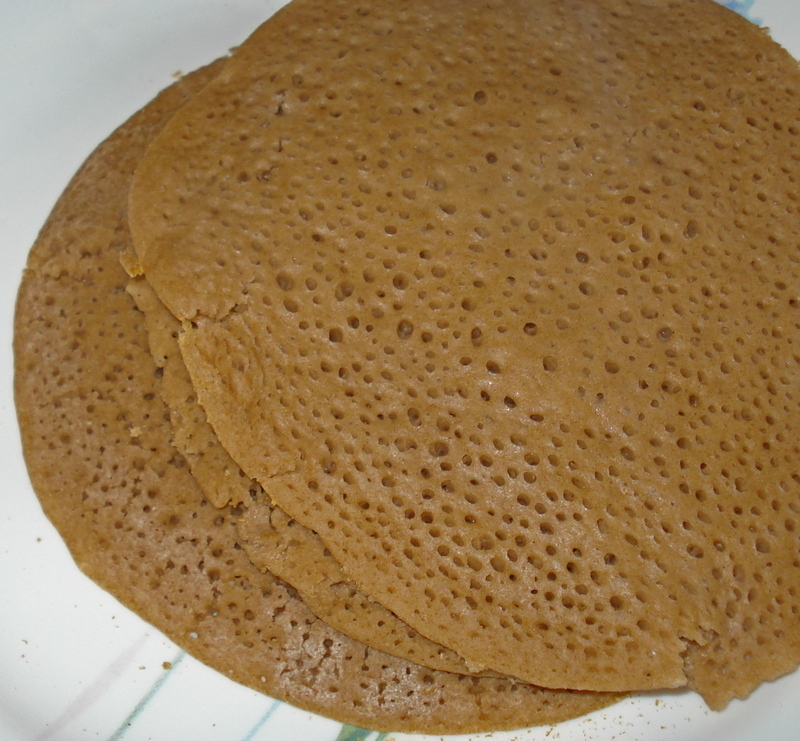 My injera aren’t quite authentic, but they are closer to the restaurant version than many of the recipes on the internet, especially the ones using Bisquick and soda water When I cook them, the bottom forms a light crust and gets a little brown. I just stack them as I cook them and they soften right up. The secret of the batter seems to be to make the yeast happy. If I ever get an incubator from a biology lab that can hold the temperature at 30C at home, I might get closer to that ideal. Total time: 3 days. Active time: 1 hour. Mix all ingredients together in a large bowl, cover with a lid or foil, and let sit in warm place to ferment for three days, stirring daily. Stir twice a day, if you can manage. My house is kept at a relatively cool temperature (65F), so I will sometimes turn on the oven on the lowest temperature setting, then turn it off when it starts heating up, and place the injera in the oven overnight to get the fermentation started. Day 1. 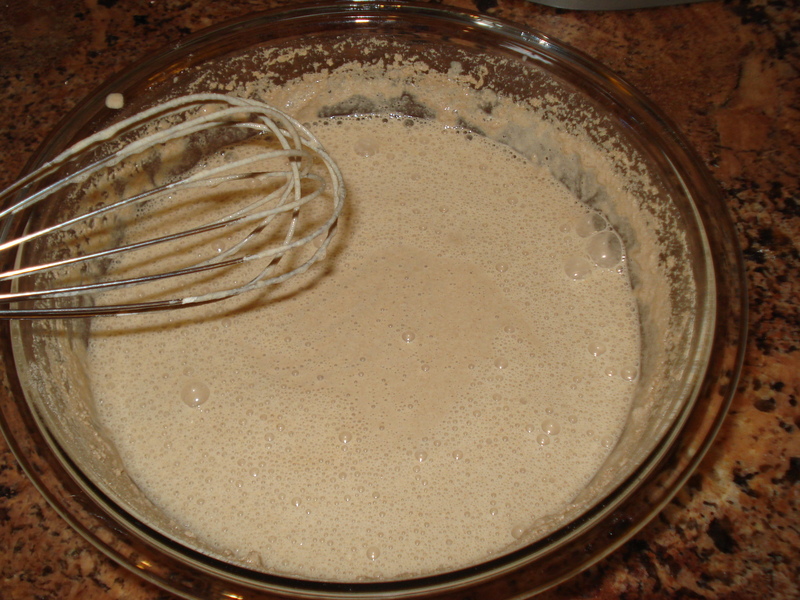 The first day, the batter forms what I think of as a sponge, a floating bubble filled mass on top of the liquid. Use a whisk to stir the batter at least once, but preferably twice, during the first 24-hour period; you will see holes when you stir it by the end of this period. The batter should start to smell very sour, like sourdough. Day 2. As the batter ferments, it should separate. You will see a light tan liquid rising to the top. Mix the liquid in thoroughly. Day 3. 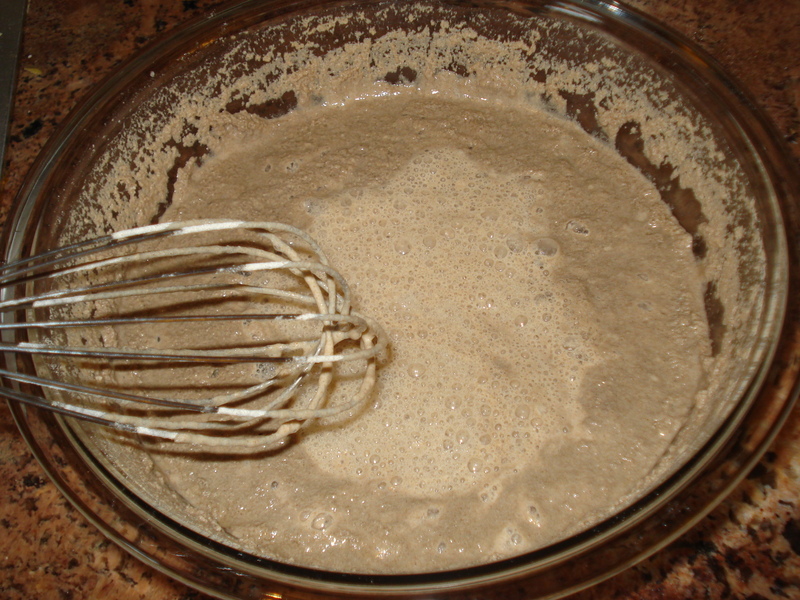 The batter becomes cohesive (i.e., there will be less liquid separating out of the mix and the consistency changes) as it ferments. You will see bubbles after you have stirred. The batter should be ready to use now. “Ready to use” is a bit flexible: several results may occur. If the batter smells like sourdough and you have many bubbles in the morning, and you want to use it in the evening, put it in a relatively cool spot to slow down the fermentation. At my house, I just put it in the cold oven and don’t warm it up again. If there are no bubbles after you have stirred and yet it smells sour, add a little bit of flour and put in a warmer place for an hour or two. I don’t always catch it at the perfect time. It is still usable; the injera won’t be as pretty but will taste good. If the batter starts smelling like old gym socks, or like it is putrifying, it has gone bad and should be discarded. 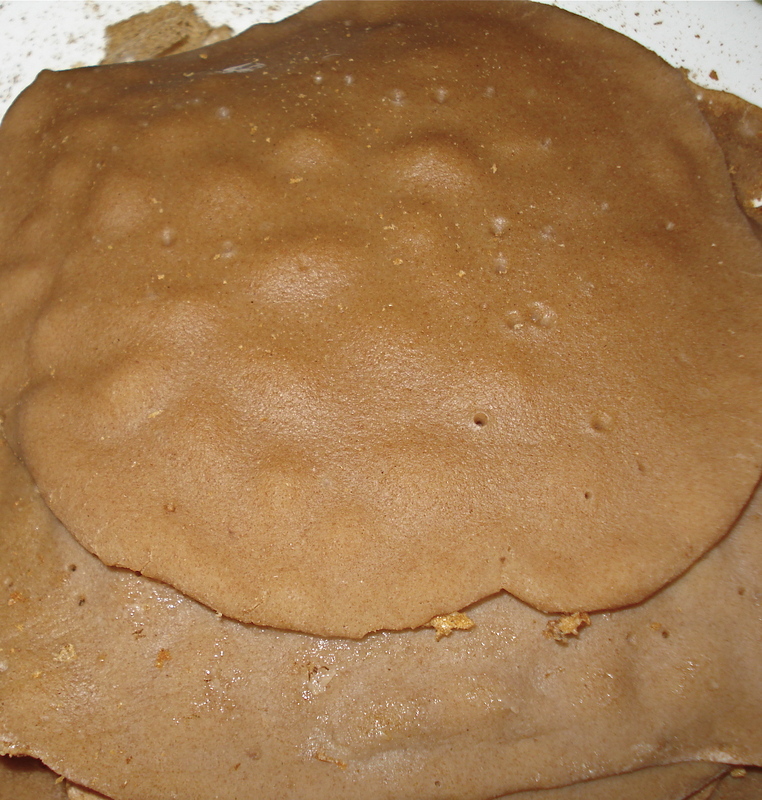 If it has been too cold or you need to cook the injera early, you may add a 1/2 tsp of xanthan gum as a binder. 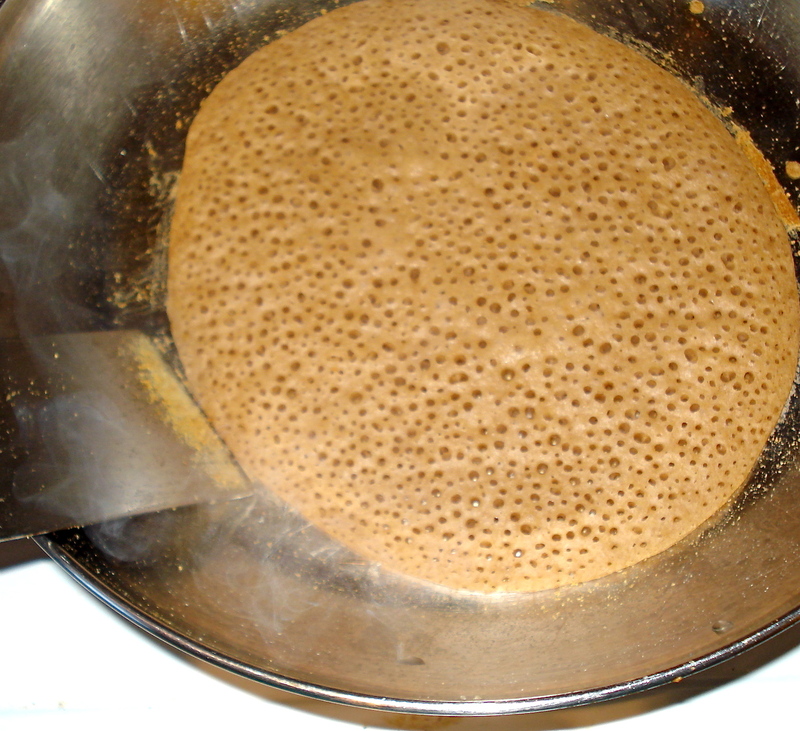 Save a bit of the batter to use as a starter for your next batch of injera. Keep the starter in the refrigerator, then incorporate it into the next batch of batter, and it will ferment more quickly. I have found that if it kept properly warm, the batter only needs to sit a day or two before cooking when using a starter. You’ll be making 8-inch wide pancakes, much smaller than the ones in Ethiopian restaurants, but much more manageable. The cooking method is a combination of no-oil frying and steaming. The whole process can take several minutes for each pancake, so allow plenty of time. After the fermenting process has finished, preheat a 10-inch frying pan on medium low heat. You can use a non-stick or well-seasoned cast iron pan, or try to manage with a regular stainless steel skillet (which will stick more than the first two options). 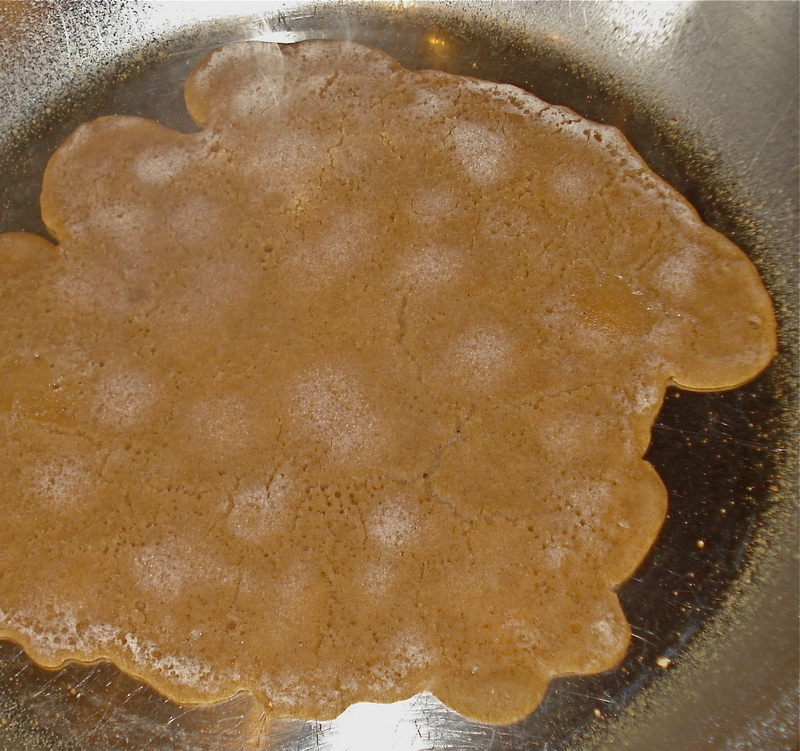 Without adding oil, pour in enough injera batter to create an 8-inch wide thin pancake. Cover pan with a lid, so the injera cooks from the bottom and steams on top. The whole bread changes color as it cooks. Remove the lid when the color has finished changing, then let the pancake dry a little before removing it from the pan. It is not always easy to get the injera off the pan, especially if you are using stainless steel. I start on the outside and loosen around the edges and then work through to the middle. The first injera I cook always turns out horrible. There are many ways injera can go wrong. 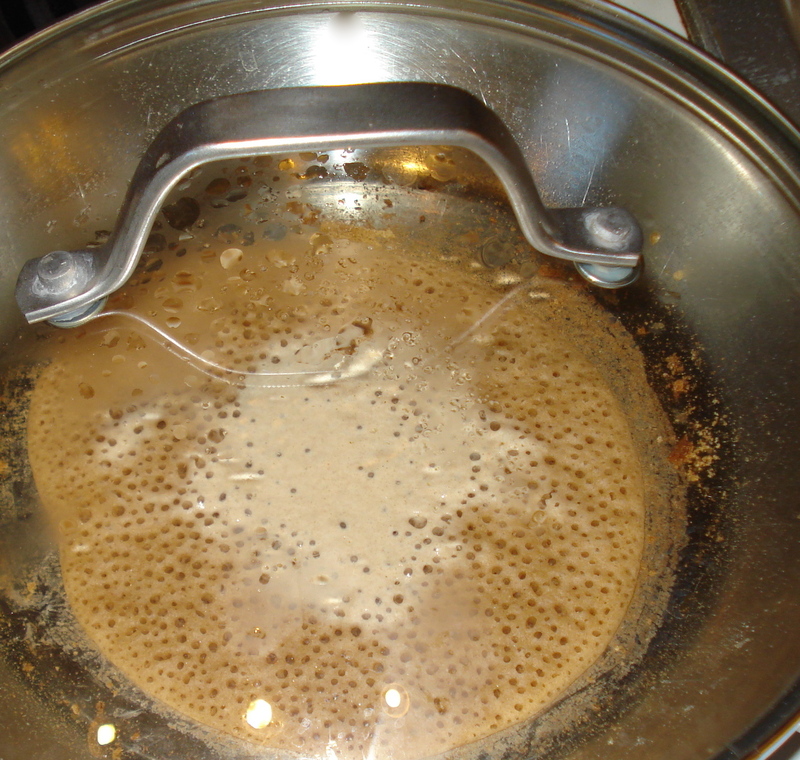 In the image to the left, you’ll see an example where the injera didn’t get the nice bubbles throughout and got soggy on the bottom since the steam didn’t escape through the bubbles. I think the problem with this batch was that it didn’t ferment properly — either the temperature was too cold or I didn’t incubate it long enough. Over-incubation seems to have a similar effect. The batch to the right has no bubbles at all. You might be able to improve an off batch by adding either some more yeast or some sugar several hours before cooking. I haven’t tried this, however. But you’ll see during cooking if the fermentation process wasn’t successful. You may decide to throw the batch away and serve rice that night. What a great post! Jennifer — I remember well your adventures with smelly gym sock poop pancakes. I’m excited for you to try this recipe! :p I especially appreciate the photos of what the mistakes look like — it brings the whole mystical process down to a much more human level. sigh…. I wonder if there’s a way for Eugene to sponsor the immigration of some Ethiopian chefs/entrepreneurs. I sooo miss the fare. I had my first taste in Boulder at Ras Kassa, back when it was just a tiny little room next to a liquor store outside of town at the turn-off to Eldorado Springs. And later when I moved to Portland I was fortunate to have the Rendez-vous Cafe at hand for a few years before they mysteriously closed (…the location was certainly odd, but the food was amazing). …or maybe we could petition a Portland joint to open one down here? As a GF Ethiopian food lover (my three years in Portland taught me to luuuuuuv the injera and all the wonders it could transport to my mouth) — I can’t wait to try this. And isn’t anything that ferments just a kick? Good post! I’m an Ethiopian food fan and injera has been a challenge for me too. Fortunately the Twin Cities has the largest East African population in the country and Injera is available at many large grocery stores. There are also numerous East African stores and restaurants so we are quite lucky. I’ve spoken with Ethiopians about the technique. The method I’ve seen most often involves using a flat cast iron pan about the size of a medium pizza. The pan is preheated (low) and the mix is invariably poured with a pitcher. The mix locals use is buckwheat and teff. I don’t know their ratio. I’ve used two buckwheat flour to one teff with uneven success and it is considerably cheaper than straight teff! After getting hooked on Ethiopian food last winter, while living in Southern California, it’s been a long struggle…there are an amazing number of recipes on the internet, but they are either overly complex and time-consuming (up to three weeks for one batch!) or just don’t have the results I want (even pictures on the sites show a flat, rubbery-looking mass with few or no bubble holes). Having actually managed to procure teff in Sitka, Alaska, I demand better! I’m excited to try this recipe, which seems both feasable and high-quality. Thanks! I also 3 months pregnant have been craving injera and beef tibs- my favorite dish from my favorite Portland Ethiopian Restaurant. Dont remember the name, but know it’s on Broadway between 8th and 10th ish. It’s on the righthandside. Well in addition to teff adding some millet flour works great. Any flour(potato,rice,corn,wheat,tapioca,manioc etc)will end up giving little bubble like outer surface if you use a bit of baking powder or sodium bicarbonate at the end of your recipe.I do not see the point of not putting a drop of oil to avoid the sticky problem with the pan though. You can get teff flour right here in Eugene, from Camas Country Mill. They sell at the Eugene, Springfield and Creswell Farmers’ Markets. Haven’t tried making this yet, but I will!! I have shiro flour and berbere that I will not eat before leaving for Addis … do you want it? I’m in Roseburg, but can get everything to Eugene via my daughter. That’s nice of you, thanks! I just stocked up on mine in Portland, though. I have never been able to successfully make passable injera at home. I can’t wait to try this recipe! You make it look do-able! I bet you would be better off getting a food cart in the university district by Alexander’s falafel and the others. Students love Ethiopian food and there would be much less competition! Hi Zee, I’ll send you an email, but just wanted to know you’d be very welcome in Eugene. The Saturday Market folks make it very difficult for new vendors to succeed. I echo Mainlymagyar’s hesitation, and worse, I’ve heard that the city makes it difficult for carts near the university with licensing and such. So I suggest instead Marketplace at Sprout in Springfield, which has a Friday farmers market/food vendor setup and also has a commercial kitchen and office space — they support new food businesses in various ways and are tremendously forward-thinking, unlike Eugene’s overly complex, dated bureaucracy. Contact Micah Elconin, who will do his utmost to help you, via the website: http://www.sproutfoodhub.org/ . Another way to get the word out would be cooking classes at Pepperberries or through LCC. If you’re interested, I could get you contacts for that, as well. You might also try to network on Facebook. There’s a new group for Food Carts in Eugene (https://www.facebook.com/groups/eugenefoodcarts/?fref=ts ) with plenty of info, and I’ve seen panels and workshops offered through small business associations in town on how to get a food cart up and running. Lastly, consider a Kickstarter campaign to raise capital — there are *so* many people in Eugene interested in Ethiopian food, I’m sure you’d get plenty of investors. Good luck! Yes, please do a food cart in Eugene!!! I could help with graphic design just out of sheer gratitude! Also Ninkasi and Oakshire in Whiteaker have rotating food cart spots. Thank you so much for you guys’ support. I’m really inspired by your encouragement. Especially Jennifer and Jenny for extending your gracious support including by emailing and letting me know you’re there to help. Jenny J, I will contact you with more information how you can help once things looking promising. I read the face-book comments from Jennifer’s face-book page and it appears that more people like to see Ethiopian food or restaurant here in Eugene. I was just testing the water, but my interest has since grown to seriously think about this because of the unexpected support from you all. My wife and I are talking more seriously how we can do this. I’m totally inspired by the community outreach support by Jennifer (the blog write), anything needed support by Jenny, the Graphic design support (if food cart is needed) offer by Christina, and all of you who commented showing interest. Yes, I’m employed fulltime right now, but my job is kind of in the limbo for possible layoff, so with that in mind and your positive support this might lead me to consider a full (but small) restaurant plan, but I don’t know how this can be achieved, but I know if would be a great thing to do in Eugene. Before I came across this blog, my initial thought was if a major change happens to my job to just move to Portland area, but entrepreneurship is possible. I will be heading out to PDX this Friday to visit a little kid (our daughter’s school friend from Eugene) who just had heart surgery in Portland. I’m goanna stop by at some Ethiopian restaurants to see if I can establish some networking in while in PDX in order to learn about supplies like special Ethiopian seasonings. I know we can get some fresh locally grown organic vegetables & meets here in Eugene. Please let the comments coming. One thing I know for sure is with your support, this can happen. Thank you! We live in Vancouver, Canada and are having the same temperature issues. It was funny because we looked up this post after trying to make injera this evening, and although it was delicious, we noticed it looked exactly like the first photo in ! I think we will try putting it in the oven overnight to keep it a little warmer – good tip. I realize this post was quite a while ago, and my comment may be way out of time, but I am in the process of making teff-based (small amount of wheat starter) injera after looking at several recipes. Too bad I didn’t come across this one sooner but I think I”m on the right track. I’ve been keeping and making wheat flour sourdough for about 13 years now (same culture), so I have some confidence, but my house too is a cool one about 65-67 F, so I never get spectacular yeast growth, but adequate. My question though is why no one uses a little baking soda (not powder!) for increased bubble action at the point of cooking. I do this when I make wheat flour sourdough pancakes and it works great -sometimes too well. If it is a little flat add a pinch of bicarbonate soda and a teaspoon of vinegar just before cooking. It can save a disaster!